Affiliate Bootcamp - Phase 1 : Lesson 1 of 10 Getting Started! Welcome to the Affiliate Bootcamp! First things first though, a little run down of the affiliate program at Wealthy Affiliate and how this training will work. I am Kyle, co-founder of Wealthy Affiliate. I am going to be walking you through the process of building a business online, through the promotion of WA and likely other programs. I have been actively working with close to 1.3 MILLION affiliates since 2005 and I have helped MANY create full time, 6-7 figure businesses online. That is my absolute focus with you. Success. I want to help you build a full time business and an established brand online. I also want to personally be hanging out with you every year at our fully paid for, Annual Super Affiliate Conference in Las Vegas (more on that later). Wealthy Affiliate is mine and Carson's passion (me on left with family, Carson on right). We live and breathe Wealthy Affiliate and as time goes on, the platform here truly evolves and gets better with every day that passes. We built WA based on helping people succeed, and we don't have any plans to divert from our core principles. If you are committed to this training, I am committed to you! That I can assure you of. The WA Affiliate Program, It's Awesome! The affiliate program here at Wealthy Affiliate is one of the most technologically advanced, sophisticated, and progressive platforms in the world. We were born and raised in this industry as “affiliates” and we are still affiliates to this day. It's in our genetic code! Because of this and being involved in 100’s of different affiliate programs over the years, we have a very good grasp as to what affiliates want and we are constantly working to over deliver. There are many different aspects to the WA Affiliate Program that you can leverage to maximize your reach, revenue and overall conversions and I am going to give you a brief overview of these now. Of course as we move through the Bootcamp training, I am going to be getting more and more advanced with this training. A few important menus I want you to understand. The first is the "$" icon in the header, if you click this you will be able to access the full affiliate resource menu (as shown below). This menu includes SEVEN items, I am going to quickly run you through all of them and then provide you with a video walking you through the ALL aspects of the affiliate program in its entirety. Program Details. This is where you can go to get full details about the Affiliate Program, the commission structures, your main affiliate link, your incentive countdown, etc. My Stats. This is where you can go to get detailed information about stats and all commissions/transactions. Tasks. These are all the interaction and communication (questions) that are taking place within WA in respect to your referrals. You will want to complete these as they come in, interacting with your referrals leads to much higher conversions. My Referrals. This will show you all your referrals that have joined through your affiliate link, both Starter and Premium. Links & Tracking. This is where you can to get all of your affiliate links, to create your own tracking links, and to add tracking for services like Google Adwords, BingAds.com and Facebook.com. Messages. 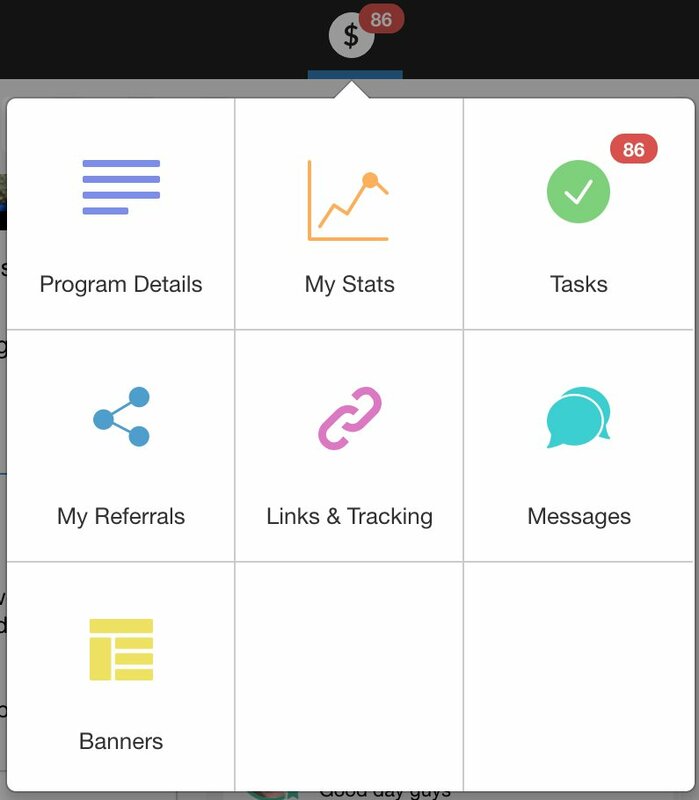 These are automated, follow-up messages that you can create for your referrals! Banners. Self explanatory here, these are banners that you can use on social media, on your website, or anywhere you like that you can add a banner promoting WA. Within the side bar, you will see the Training buttonwithin the menu. Then upon clicking that, it will open the training area and you will see the Affiliate Bootcamp training area as the second item down. If you click this menu, it will pop open all of the phases of Bootcamp. Each Phase has 10 lessons and as you move through this training and check off the tasks, you are going to notice that the Affiliate Bootcamp button text will update to reflect which lesson you are currently on. In other words, it is a "smart" button and will always take you back to your last completed task within the training. Your Potential & Commission Structure. The affiliate program at Wealthy Affiliate is not just advanced from a technology standpoint, but you are also getting one of the most appealing RECURRING commission structures in all of the affiliate marketing space. If you are a Premium Member here at Wealthy Affiliate, you get double the commissions as an affiliate and you also get to take part in our $1 credit program, which allows you to earn from free members you sign-up that set-up their accounts. You also earn money with each domain your referrals buy. When you sign-up someone for free, your goal is to get them to set-up their account. Setting up ones account will lead you to an initial $1 (2 credits x $0.50). These add up when you are a Premium member. We offer lifetime commissions and lifetime cookies, which is truly unheard of in the industry. If you refer someone to WA, they are your referral FOREVER. Unlike many programs in the industry that focus on "taking advantage of customers", our focus has and always will be making our service better. The better our service gets, the more people that stick around, stick around for longer, and the better our conversions get. That is our PATH to making you more money. Striving to make our service the best in the industry is our goal and this will remain our constant focus. The MONEY you earn as a result of this and the trust you build from the people you refer to Wealthy Affiliate will lead you to a long term and INCREDIBLE business online. **We pay out on the 1st of every month, and we have not missed a single affiliate payment since our inception 14 years ago. We pay on time and we pay out MILLIONS of DOLLARS per year! Task 1: Add Your Affiliate Goals! We have created a discussion where you can add your affiliate goals, not just for the upcoming bootcamp though. I am a long term guy myself. I know what can be accomplished in a year...a year is a like a blink in time and before you know it next year is going to be here. What if you could make 100 referrals by next year...what about 200...what about 500....a 1000? Be realistic, but be unrealistic. You never reach goals that you thought were unattainable if you never set them. Add your goals here within the following thread. ==> ADD YOUR GOALS: What are your WA Promotional Goals in 2019? Also, comment on AT LEAST two other people's goals within the thread. This is a community here at WA and we are all here to help one another succeed. You can begin your networking now and you are going to build some awesome relationships which will only further your online success. So take a minute and encourage at least two other people with their goals as well. I want to let you know about something as well. If you can reach 300 unique referrals through the course of this year, we are going to fly you to Vegas for a private conference (read below). Task 2: Las Vegas, We Want YOU There in 2020! We like to do things differently at Wealthy Affiliate. Other companies try to convince you to attend their "high ticket" conferences, we want to PAY for you to come to our conference. Every year we run an ultra exclusive WA Super Affiliate Conference in Las Vegas, all expenses paid. You may have noticed a counter in your Airplane Icon in the header, if you can make 300 referrals in a calendar year, you are going to be personally invited by Carson and myself to hang out in Vegas next year. Read about the experience from the most recent years conference. It was the most powerful, amazing conference to date and we would love nothing more than to have you there next year! DISCUSSION: Las Vegas 2019. Incredible. 2020 Will Be Insanity! Here is an introduction video to Wealthy Affiliate. 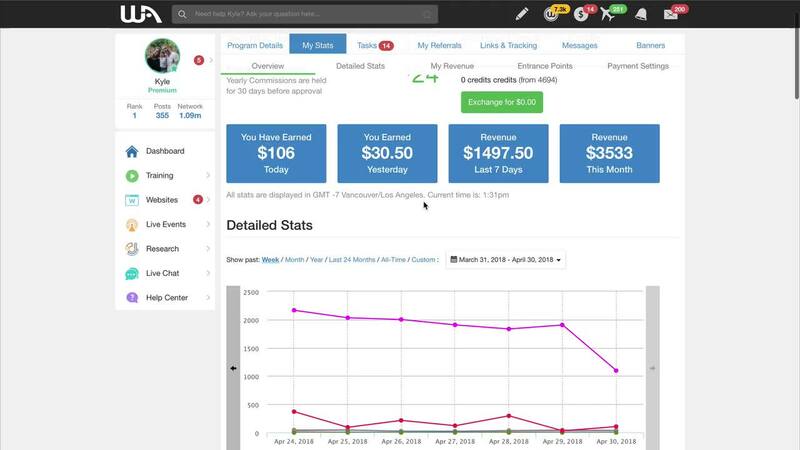 This is going to give you an overview of your stats pages and show you around the set-up of your affiliate account. It is important that you go through this so you fully understand the process. We run promotions throughout the year and update our affiliate program regularly. We want to keep you informed of any timely offers that you can take advantage of. We will also be able to connect with you to offer specialized training, promotional materials, motivation, and new advancements to the Bootcamp course. You Are Already Officially Part of Affiliate Bootcamp! This is a necessity if you want to become a top affiliate. I want you to take a second right now and officially join Affiliate Bootcamp by clicking the button above. It is going to help you keep on track, keep you informed, and is going to allow us help you make more money! This is a requirement to continue with this course...and something that is going to help you out as well! 3. Tell us if you plan on making the Las Vegas Conference in 2020! So, if you choose to promote a product, your niche is that product (or anything associated with it); if you choose WA affiliate program - then your niche is a certain group of people (taken by age or profession or specific customs or whatever stand them out from the general crowd). If that is so (?) - than how broad it should be? Wow a lot of information and hoping I do this right! I wanted to use the niche Affiliate marketing for Beginners, as I am just a beginner. I read Robert-A's comment about SEO for keywords and I am a bit lost there as to what he is talking about; is that for paid keyword search? You are entitled to view, amend, or delete the personal information that we hold. Email your request to our data protection officer [Name] at [email] and we will work with you to remove any of your personal data we may have. What do we put for Name and Email of data protection officer? I would just put your first name there - I put Steve in mine. It's unlikely that it will ever be even read by any of your visitors.